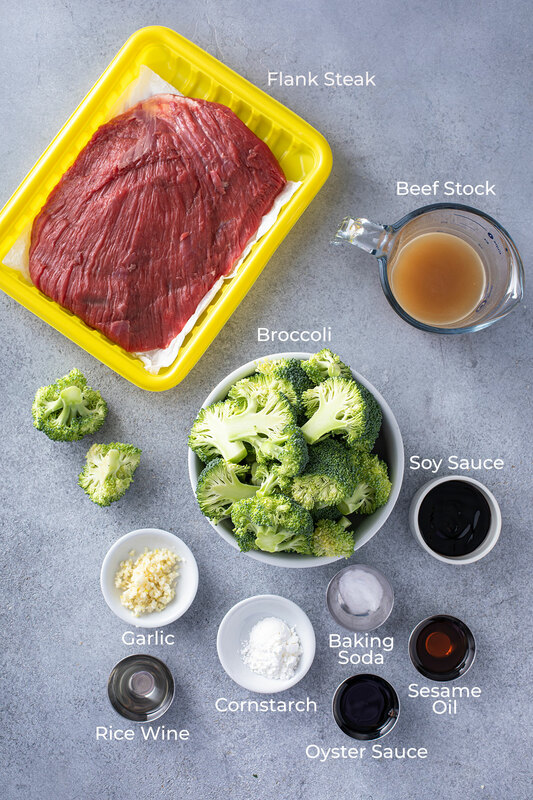 You are here: Home / Meat / Beef with Broccoli – Better Than Takeout! 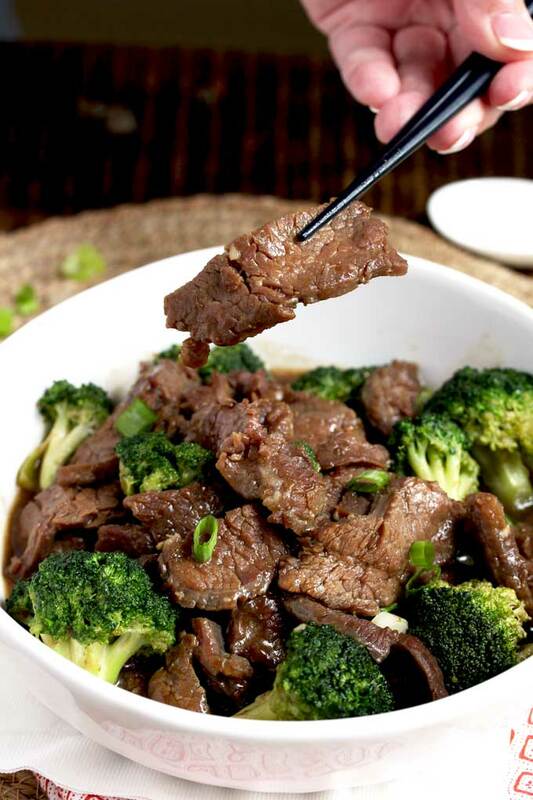 Beef with Broccoli features thin slices of tender beef and crisp fresh broccoli coated in a tasty savory sauce. 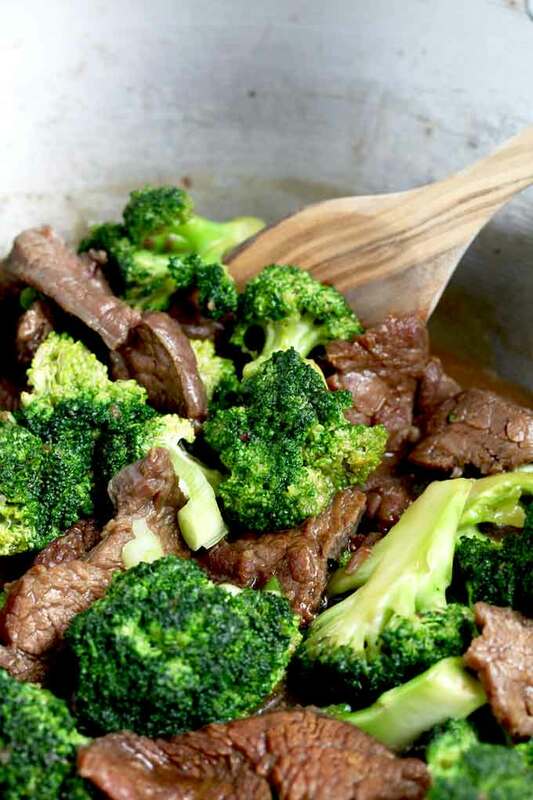 Make this easy Beef and Broccoli recipe at home in less than 20 minutes! 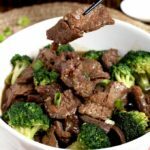 This Beef with Broccoli recipe is as delicious as your favorite Chinese take-out but without all the extra added oil. Making your favorite Chinese recipes at home is easy, quick, healthy and budget friendly! Take a look at my healthier version of Orange Chicken, it is one of my family favorites! Every time someone asks me for a healthy and quick dinner recipe, I always suggest stir fry! You can customize any stir fry to suit your taste and it is all made in one wok or skillet. Perfect for busy weeknight dinners. 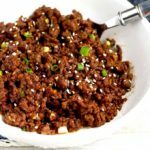 This beef stir fry is one of my favorite Chinese recipes to make! The thinly sliced flank steak is marinated in a simple 4-ingredient marinade, then quickly cooked until tender and juicy. Fresh broccoli is added and cooked for a couple of minutes until crisp-tender and beautifully bright green. 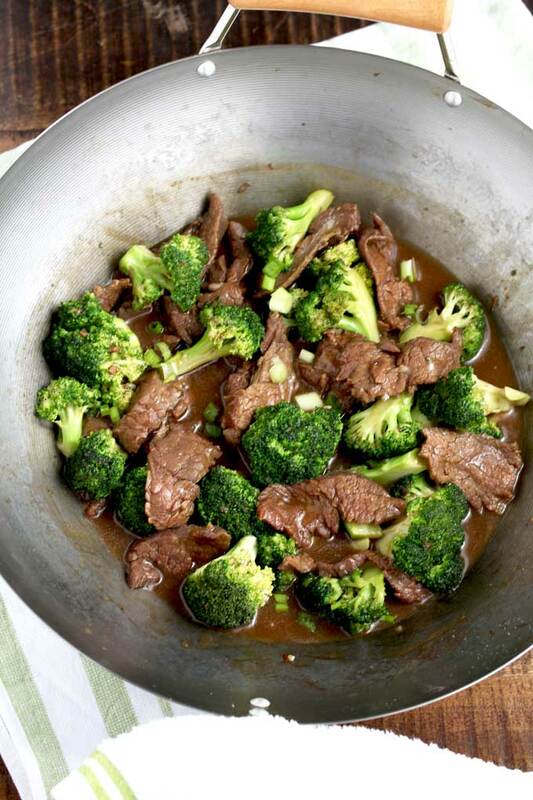 After adding the sauce, both beef and broccoli soak up all the amazing flavor of the velvety and rich stir fry sauce. That is what I call total deliciousness! 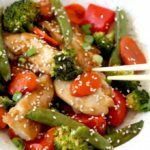 The 3-ingredients stir fry sauce is a cinch to make and so much better than any store bought sauce. All you need to do is mix the ingredients and you are done! The best cut of beef to make this healthy stir fry is flank steak. Slice the steak against the grain (that means cutting across the lines that run along the length of the beef). Organization is key! Gather all your ingredients. Do your prep and have everything ready to go before you heat up the wok! (or skillet). To get a nice sear on the beef, blot the meat dry with paper towels before slicing it. Slice the meat and mince the garlic. Slice the green onions (optional) to use as garnish. Marinating the beef is of extreme importance. The marinade not only imparts flavor but also tenderizes the meat. While the flank steak is marinating, make the sauce and trim/prep the broccoli. Heat up the wok or skillet to high heat. While stir frying, keep the food moving. Stir constantly! FUN FACT: Velveting is a Chinese cooking technique commonly used for stir frying. Slices of meat are marinated in egg white, a liquid – like wine or soy sauce – and cornstarch. After marinating, the meat slices are usually blanched in hot oil. Then stir fry. Freeze the beef for 30 minutes before slicing. The beef will get firm making it easier to slice. Slice your steak thinly and against the grain. 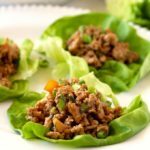 Serve this amazing Chinese favorite with steamed white rice, brown rice, fried rice, cauliflower rice, quinoa or noodles. In the recipe’s notes below, I suggest that if you want your broccoli cooked a little more (not just crisp-tender), you can lower the heat, cover the wok or skillet with a lid and cook the beef and broccoli a bit longer. Although this step helps at home, real stir fry is never cooked on low heat. However, at home, I would do this if someone likes their vegetables on the softer side. The Cornstarch in the marinade mixed with the soy sauce creates a coating that gives the meat a silky, tender and smooth texture. This is call Velveting. The Baking Soda tenderizes the beef. The oil helps distribute the cornstarch and baking soda and also helps the meat absorb flavor. Recipe adapted from my friend Jet Tila’s cookbook 101 Asian Dishes You Need To Cook Before You Die. I highly recommend you get it soon! Try this super easy and tasty Asian inspired Honey Soy Baked Chicken Drumsticks. A kids (and adult’s) favorite meal! WANT TO TRY THIS BEEF WITH BROCCOLI RECIPE? PIN IT TO YOUR DINNER BOARD TO MAKE IT LATER!! Slice the beef into thin strips and add them to the marinade. Let the beef marinate over the counter for 20 minutes or in the refrigerator for a few hours or overnight. In a small bowl, stir together the stock, rice wine, oyster sauce and the remaining 1 teaspoon of cornstarch. Mix until well combine. In a wok or large skillet heat the oil over high heat. 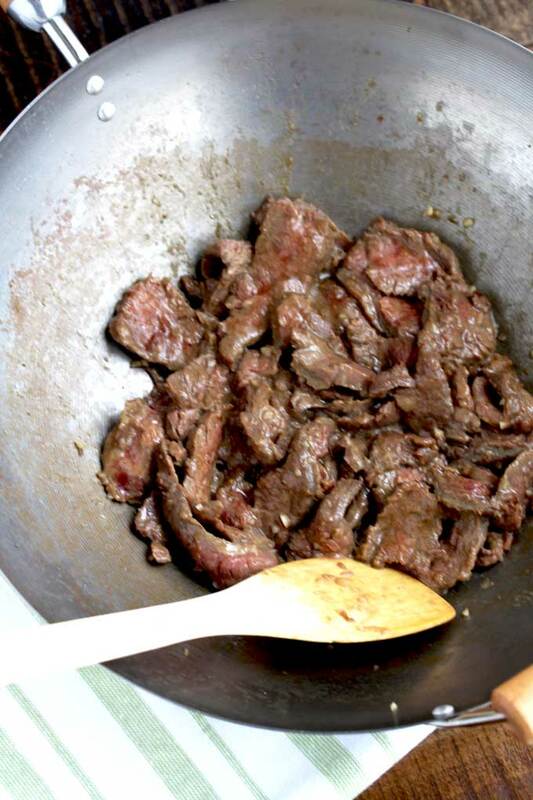 Add the marinated beef and garlic and cook for about 2 to 3 minutes stirring constantly. The beef should get a nice sear but still be rare to medium rare inside. Turn the heat to medium and add the broccoli florets. Cook for about 2 minutes stirring often. Stir in the sauce and mix well. Cook for a few minutes tossing the ingredients (stir frying) constantly. The sauce will start to thicken and turned into a nice glaze. Remove from the heat, garnish with sliced green onions (optional) and serve. Freeze the beef for about 30 minutes before slicing. The beef firms up and it's easier to slice. Slice the beef against the grain. If your sauce/glaze gets too thick after cooking, you can add additional broth to make it thinner. If you like your beef rare, only cook it for about 1 minute before adding the broccoli. If your broccoli is too al dente for your taste, turn the heat to low and cover the wok or skillet and let the stir fry cook for about 2 - 3 minutes. Keep in mind this will also cook the beef a bit more. I like how authentic this dish is without all the extra oil. All the tips are so helpful, I always get overwhelmed in the kitchen but your explanation really helps. Than you Sarah. Just get organized! This is my favorite Chinese recipe!! Before I used to order at a Chinese restaurant, now I prepare myself for the family and get a lot of compliments. Thank you Kathy for all the details, you should make a cook book with all your recipes, they are all good. Hope you’re well. I’m going to make this at work today. Great Easy recipe. Made for the two of us with a little left over. wonderful. Loved the sauce with the oyster sauce. Thank you! Yes on the T-bone, drooling over here!